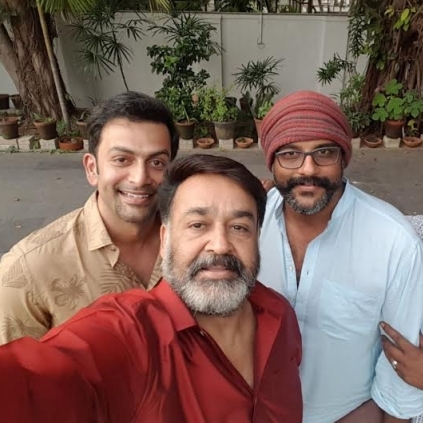 The soon-to-be director Prithviraj met with Mohanlal along with his writer Murali Gopi and Producer Antony Perumbavur today in Kochi to discuss their upcoming project Lucifer. Addressing the media, Antony Perumbavur said that "Lucifer" will be a movie that satisfies all kinds of audience, while Murali Gopi stated that it is a very challenging job to write for an actor who is a mass hero and the most celebrated actor at the same time. The director Prithviraj said that this is the first time he got to meet Mohanlal in person after Mohanlal expressed his willingness over the phone. Thus Prithviraj considers this as a debutante director meeting his lead actor and an Official Kickoff of Lucifer. The Superstar Mohanlal said that he is deeply indebted to the film lovers who have been showing great support for this movie. Lucifer will go on floor in May 2018. Just in: AR Murugadoss announces the release date of his next! Mohanlal gets featured in Georgian TV! Mani Ratnam's Cheliyaa USA theatre list! Mani Ratnam's Kaatru Veliyidai USA theatre list! People looking for online information on Mohanlal will find this news story useful.